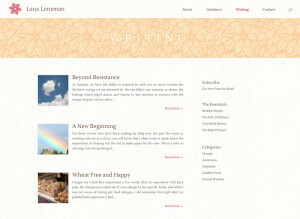 As the title of Lana Lensman’s website would indicate, her work is about simplicity and joy. The key to this site was finding the right balance of minimalism to fit the theme of simplicity without stripping the site down to nothing. I can’t tell you how many websites about spirituality we looked at that had a jarring effect on the eye. Many were just text on a white background. Others had competing design elements that left the viewer confused as far as what to focus on. We talked a lot about the use of color to define different elements of the page. Here color not only separates the top menu and the sidebar so each stands out, but also keeps the eye moving. The viewer subconsciously takes in the whole page and comfortably settles on the logo. Minimalism isn’t easy to do, but when done right it really shines.